Do you need the hands? Yes and no. One of the things that has fascinated me of late is the use of hands in aikido. By way of example, I'll talk about kote gaeshi. Last Saturday, I attended part of a godogeiko, or dojo "play day" (a sort of informal gathering of various schools and styles of aikido getting together to play and experiment without any real formal teaching). One of the things we played with was performing kote gaeshi without ever getting what you might think of as the "classical" grip or twisting uke's wrist. Instead, uke clasped both of his hands together, outstretched in front of him. As tori evaded in a tenkan, turning, fashion, he simply laid his hand on uke's. When it came time to change directions and apply the throw, tori simply put his other hand on uke's forearm. I've also seen many other very subtle, high ranking folks throw it as they separate from uke, with little more than a pinky and ring finger lightly hooked on the base of uke's thumb. Not a lot of contortion there, either. 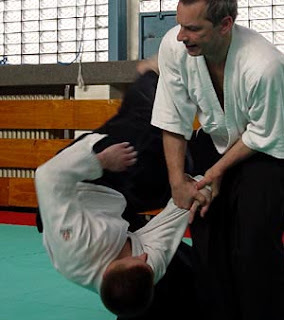 That might seem antithetical, considering the name itself means "wrist reversal" and as far as Tomiki systems go, it's part of a section of junana hon kata, or randori no kata, called tekubi waza, or "wrist techniques." So why would we even bother with trying to execute it without doing anything to the wrist? But that's not all. You can look at many techniques the same way. There's a point in mae otoshi, for instance, when tori will usually coil uke's arm prior to the through, or there's a certain amount of wrist control involved with shiho nage. I think the point, the question we ought to ask ourselves is this: even though there are many times and situations where uke's wrist is available for contorting and controlling, is it necessary to make the throw happen? While wrist control is great and all, are we too fixated on it, rather than on basing our aikido in our centers (hazumi) and on timing? Now, all that being said, I've made a particular focus lately of what exactly my hands are doing when I've got a hold of uke, and I've noticed some amazing, albeit subtle, things, things that many of my peers don't seem to be aware of to the fullest extent. Is it necessary? Obviously not. But I think it's important to study the big picture as well as the details, to master the broad strokes and the minute details. The critical thing to remember is that I'm not manipulating the wrist just for the sake of manipulating the wrist. I'm certainly not in it to cause pain, to rely on discomfort to make uke voluntarily jump on his own head just to alleviate it. Believe me, I've seen enough people who are immune to it (plus I don't see many tiny women inflicting much pain in a larger, refrigerator-shaped uke). Wherever I'm connected, be it the wrist or the elbow, or whatever, my ultimate aim is to break uke's posture, to break his alignment down (good alignment and posture is shoulders over hips over feet; we want to disrupt that somehow). The wrist or the elbow or the chin, etc. are merely ways of affecting that alignment. It all involves a moving center, but you also gain an eerie degree of control when you know how to manipulate a wrist. Let's go back to kote gaeshi. I know of one lady who used it as a means of control when a gentlemen tried to get a little frisky with her. She held him prone on his knees with it until security came and escorted him out of the building. No one ever got thrown, but she was able to bring a situation under control and prevent anyone from getting hurt. That strikes me as a good a definition of harmony and "true budo is love" as I've ever heard. If I simply take uke's wrist and start contorting it, it may break his posture; if the guy is bigger and stronger than me he can easily resist, and certainly if he's skilled enough, he can reverse it. But once uke's posture is broken, I find you can keep it broken with those wrist controls. Rather than a big air throw, you can set uke down gently. And it's amazingly difficult for even the biggest and strongest people to deal with those joint controls from a broken posture.